Pour all ingredients into a large bowl, and heat the mixture in the microwave for about 20 seconds. 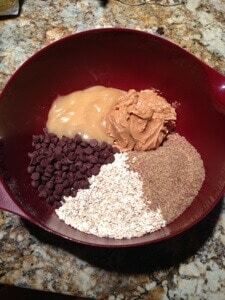 This makes it easier to stir everything together, and also melts the chocolate chips. I personally like this, because it allows the chocolate to be more evenly distributed throughout the bites. However, if you want the chocolate chips to maintain their shape, you can skip this step. Roll the mixture into 3/4 inch balls, and let them sit in the fridge overnight. I whipped these up tonight, and couldnt wait to have one. So after about 2 hours in the fridge I grabbed one. Yummy!! I cant wait to have more. Thanks for sharing this great recipe. I made these lastnight, and they’re delicious! My parents even like them 🙂 Thanks so much for this great healthy snack! That’s wonderful to hear 😀 I’m glad you enjoyed them! Tonight was my second time to make these, and this time I tried something a little different. Instead of the chocolate chips I used Cinnamon chips and I used peanut butter made with cinnamon and raisens. Soooo yummy! 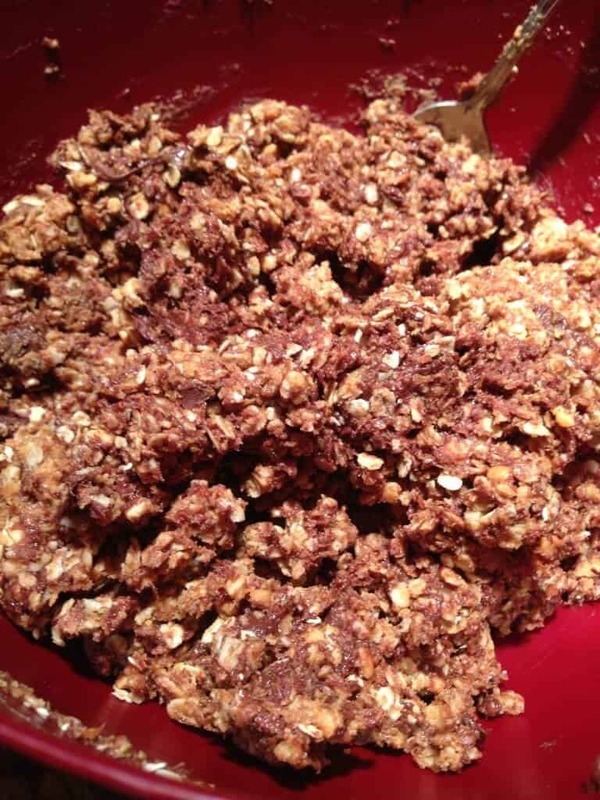 Made a batch 4 the first time this a.m. so my hubby would have some to take to work and eat them on his lunch break….so quick, so easy, and yummy! I also thought these would be great with a cut up Apple for the kids when we take a conforming break from our school work. Thanks 4 sharing! DELISH!!! do you have the nutritional info? 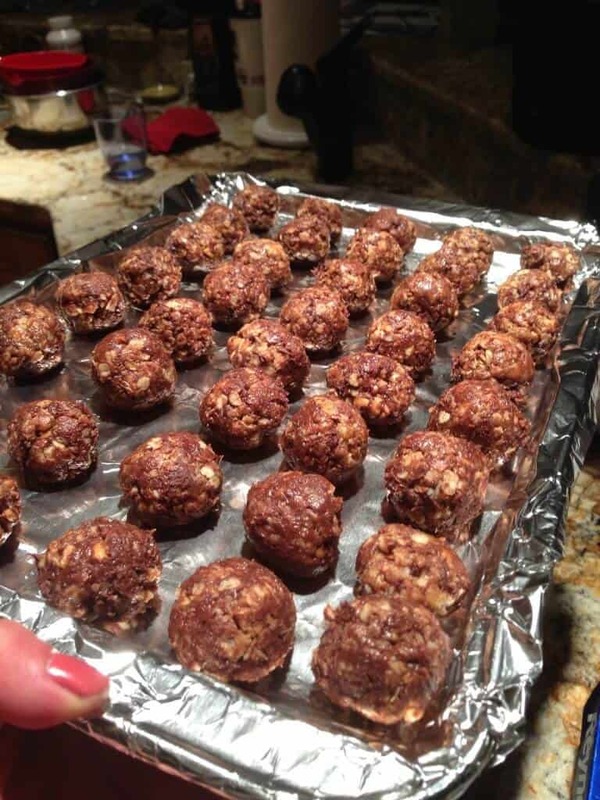 I made about 60 balls, so each one had 75 calories, 1.5 g of fiber, and 2.2g of protein! Do I have to store these in the fridge? After the 24 hours? I prefer to store them in the fridge, because they keep their shape better, and are less messy! I also like eating them cold. That being said, you do not have to refrigerate them. All the ingredients are non-perishable, so you definitely can leave them out. They should stay good for quite a while, but I’m not sure exactly how long, I’ve never had any left after a couple days! Do you know how long they will keep? Yes you can!! They freeze well.